Oshi is a bitcoin casino operated by Direx N.V. with a license in Curacao. The casino has been online since 2015, and they pride on being transparent and strongly focused on providing a superb gaming environment. Oshi casino is also known for having plenty of bonuses, and players can even create their own bonuses. On top of that, the bitcoin casino has a high RTP of 97%. To find out more about Oshi.io, read our detailed Oshi casino review below. The Oshi casino signup process is simple and takes less than 15 seconds. Note that email verification is required. The Oshi gambling platform has an intuitive user interface and clean design. The casino has a nice layout, with quick links to all casino games, bonuses, and promotions for faster navigation. There are no flashy elements on the website, allowing users to focus all of their attention on what’s really important – casino games. Oshi casino claims to feature over 2500 games, but once you enter the website and set all casino games to show there are 1905 games. But even with a little under 2000 games, Oshi casino still has far more games on offer than its competitors. On the website, casino players will find all games filtered by type – slots, table and card games. The games are divided into six main categories – slots, jackpots, roulette, blackjack, card games, and live casino games. Oshi casino further displays the newest and most popular games. Now, what’s really impressive about Oshi casino games is the number of filters players can use to find a game that suits them best. There’s the option of sorting the games by providers, ease of play, and even by game color and theme. Casino players also have a lot of filtering options to help them find the perfect slot game. Namely, slots can be filtered according to the predefined number of reels or number of win lines, whether they feature scatter symbols, wilds, free spins, bonus games, or all of what we've listed so far. The most popular games section at Oshi casino includes slot games such as Good Girl, Bad Girl, the Slotfather, Fruit Zen, Platinum Lightning, and Diamond Vapor. Moreover, free play is also available and finding out which games can be played for free is quite simple – just look for the ‘Try’ button next to the game. 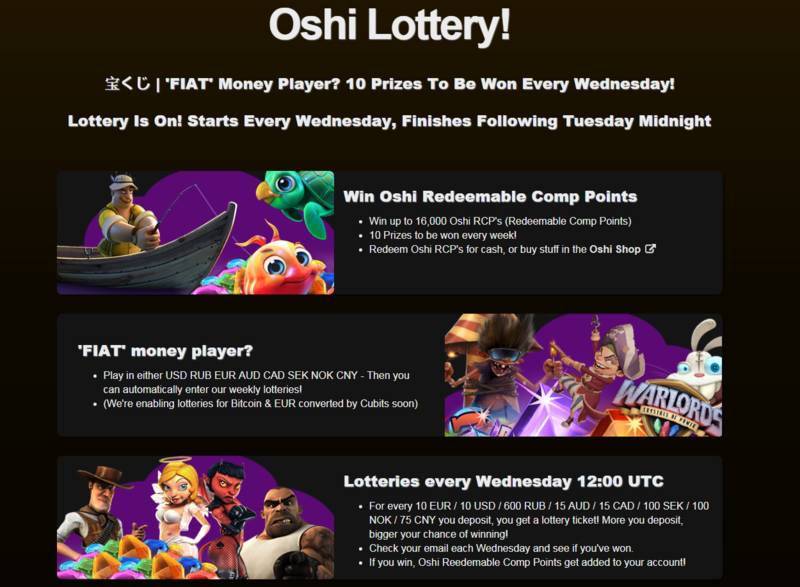 Oshi.io works with 18 leading game providers, 16 of which provide slot games. You can see the complete list of software providers along with the number of games they offer below. Once we went through all the Oshi casino game providers, there were 1533 games in total – almost a thousand less than advertised by the casino. When it comes to provably fair games at the casino, only SoftSwiss games have a certificate from iTech Labs. We asked a live chat agent to tell us more about provable fairness at the casino, and other than informing us that SoftSwiss games are provably fair, we received no further information. On the other hand, Oshi casino has an entire page dedicated to fair gaming and is transparent in that regard. They state that each one of the games available at Oshi casino has been tested for fairness and accuracy and that if a player feels they’ve been “rigged” they can contact the casino’s support team and discuss their issue. Oshi casino games have a decent loading time, and casino players with a steady internet connection can load a game in about 15 seconds. Users with a slower internet connection can adjust graphics quality to help load games faster. We tested Oshi casino loading speed, and the results for the desktop version of the website were excellent. Namely, the homepage got a score of 78/100, while the Lights game scored 88/100, and Fruit Zen got a PageSpeed score of 98/100. With that said, casino players can expect both fun and fast gaming experience at Oshi. When it comes to game display options, they vary from game to game. Namely, for some games, it is possible to turn on the fullscreen mode, while others that don’t have that option are displayed in widescreen. Oshi casino doesn’t have a dedicated casino app, but they do everything to make the gaming experience great on any device their clients might use. According to the website, it doesn’t matter from which device you’re accessing the casino, as Oshi.io is fully responsive and ready to be used from a desktop, mobile, or tablet device. We, however, can’t write an unbiased Oshi casino review if we rely solely on what it says on their website. So, we also browsed the website from a mobile device. While the game loading times are significantly higher compared to those of the desktop version of the website, the graphics quality and animations are great. Aside from the major payment methods such as Neteller, Visa, MasterCard, Skrill, bank transfers, Trustly, and Skrill, the casino also supports deposits and withdrawals through Accentpay, Promsvyaz, QIWI, Yandex money, and Svyaznoy, while Bitcoin payments can be made through Cubits. Aside from Bitcoin (BTC), the casino accepts the following currencies – Euro (EUR), United States Dollar (USD), Australian Dollar (AUD), Russian Ruble (RUB), Canadian Dollar (CAD), Norwegian Krone (NOK), Swedish Krona (SEK), and Chinese Yuan (CNY). As far as deposit and withdrawal limits go, there are different minimum deposit amounts depending on the currency. While Bitcoin deposits don’t have a minimum deposit limit, the minimum deposit amount for other currencies is as follows – 10 EUR/USD/AUD/CAD, 100 SEK/NOK, 80 CNY, and 200 RUB. The casino’s minimum withdrawal limits also depend on the currency and are set at 10 EUR, 20 USD/AUD/20 CAD, 100 SEK/NOK, 200 RUB, 30 CNY, and 0.001 BTC. When it comes to maximum withdrawal limits, Oshi casino players can withdraw a maximum of 4,000 EUR/USD/AUD/CAD, 50.000 RUB, 40.000 NOK/SEK, 12.000 CNY, and 5 BTC. 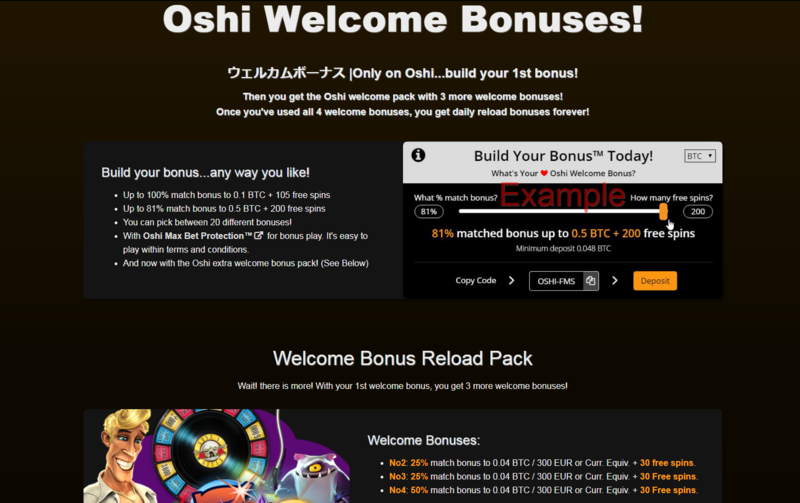 Oshi casino is one of the few Bitcoin gambling sites – if not the only one – that offers its customers the opportunity to build their own welcome bonus. On top of that, the welcome bonus is not the only Oshi bonus available to casino players. At the time of writing this Oshi casino review, there is no Oshi casino no deposit bonus code. However, once they’ve signed up for the welcome bonus, Oshi casino players will get a chance to use three more reload bonuses. There are also tournaments, daily deposit bonuses, and much more. The casino’s welcome bonus or the first deposit bonus gives new casino players the opportunity to choose whether they want a higher percentage of a matched deposit bonus or more free spins. With the 100% matched bonus, casino players will get 105 free spins, and the minimum deposit amount will be set at 0.00069 BTC. The maximum number of free spins a player can get with the Oshi welcome bonus is 200, and in this instance, the matched deposit bonus will be 77%. The minimum deposit amount for this bonus will be 0.00335 BTC, meaning the higher the percentage of a matched bonus the lower is the minimum deposit amount. Whichever bonus offer you choose, you’ll get an Oshi casino bonus code which you should use when making a deposit. The wagering requirement for the welcome bonus is 40 times, and the maximum bet with bonus money is €5 or the equivalent amount in other currencies Oshi.io supports. There’s also a list of slot games where you can use free spins you got from the Oshi welcome bonus. The selection of twelve slots includes Lucky Lady Clover, Lucky Blue, Lucky Sweets, Desert Treasure, Book of Pyramids, Hawaii Cocktails, Brave Viking, Slotomon Go, Scroll of Adventure, Princess Royal, West Town, and Princess of Sky slot games. Once you’ve used your first deposit bonus, you can also benefit from the casino’s second, third, and fourth deposit bonus that come as a part of the welcome bonus reload pack. With the second and third deposit, there is a 25% matched deposit and 30 free spins for both deposits. The fourth deposit bonus comes with a 50% matched bonus, and it will also award you with 30 free spins. That is a total of 290 free spins with the Oshi casino welcome bonus pack. Note that you can only use one bonus at a time, and should also carefully read the bonus terms and conditions. When making a new deposit every day, Oshi casino players get a new random reload bonus. These reload bonuses can be either matched deposit bonuses up to 0.007 BTC or free spins and, in order to activate the bonus, players should place a deposit of at least 0.0007 BTC. Free spins can be used on the following slots: Princess Royal, Book of Pyramids, West Town, Lucky Blue, Slotomon Go, Scroll of Adventure, Brave Viking, Lucky Sweets, Desert Treasure, Hawaii Cocktails, and Fantasy Park. When it comes to some general rules relating to Oshi casino reload bonuses, players are entitled to one reload bonus per day and have one day to activate the bonus, and one week to use it. The wagering requirement for both the matched deposit bonus and the free spins is 40 times the bonus amount. With the Oshi weekly lottery that starts every Wednesday at 12:00 UTC and ends the following Tuesday at midnight casino, players can earn redeemable comp points (RCP). In order to participate, players should deposit at least $10 or the equivalent amount in other currencies supported by the casino. Deposits made through Cubits, however, don’t count towards this promotion. Each time players make a minimum deposit amount they’ll get one lottery ticket. The more deposits they make, the higher their chances of winning. The first prize is 16,000 RCPs, which can be exchanged for cash or other items available in the Oshi Shop. Each Oshi comp point is worth 0.0000062521 BTC, and for each bet of 0.0000312674 BTC, you’ll get one comp point. So, every time you make a deposit and play with real money, you’ll get Oshi comp points. You can either redeem these points for cashback that comes without a wagering requirement or free spins. The website has a VIP program for casino players based on their activity. The more deposits and bets players make, the sooner they’ll earn the VIP status. There are five VIP tiers, each coming with their own benefits. The VIP status is valid for a week, and then based on your activity in the previous 14 days you can either climb up or down the VIP ladders. VIP members of Oshi casino are entitled to cashback bonuses on all of their losses. Third-tier players get 5% cashback with 3x wagering requirement, while first-tier VIPs get 10% cashback and 1x wagering requirement. Another benefit of becoming a VIP player at the Oshi casino is the opportunity to get free spins for any SoftSwiss slots game. Aside from the above, VIP casino players have access to exclusive VIP games, a dedicated manager, and they can get random gifts and rewards. Oshi.io is available in four languages including English, Russian, Portuguese, and Swedish. As far as country restrictions go, at the time of writing this review, the casino doesn’t accept customers from France, Israel, Spain, the UK, or the US. When signing up at Oshi casino, all the info you need to provide is a valid email address. You should know that the casino reserves the right not to pay any winnings to accounts that have used a disposable email address during the registration process. Oshi casino holds a license in Curacao. Furthermore, all the casino games are said to have been tested by iTech labs, and the casino has the status of a provably fair platform. Oshi casino uses 128-bit encryption technologies, and it is a primarily bitcoin casino. Taking into account these factors, casino players can enjoy playing casino games in a safe gambling environment. Oshi casino offers various ways of contacting the casino’s support team. Namely, Oshi customers can contact the customer support via live chat feature, online form, and email. Phone support is not available at this time. The website also has an excellent knowledge base with some of the most commonly asked questions about Oshi.io. When it comes to support representatives, they respond quickly. Their knowledge about the Oshi casino, however, seems to be based on scripts only. In cases where they cannot refer you to a specific section of the website to help you get the answer you’re looking for, you’re very likely not to get an answer at all. We’ve come to the very end of our Oshi casino review. With more than generous bonuses and a safe gaming environment, we can conclude that Oshi casino is one of the better options out there. The wide variety of payment methods is also worth mentioning, while the lack of a dedicated mobile app and the country restrictions might be considered a downside to some.